- The King was caught in many places in different disguises. He was met during doing shopping, meeting friends, visiting medial buildings as also at different parties together with his kids and without them too. - There were many suits and dismissed cases at the same time against Michael, mainly: suited in loans business. Last dismissed case was December 23, Michael Vs. Mr. Schaffel, case for finance business. Before last case and totally nonsense: Michael Vs. Mrs. Billie Jean, case about rights to sight with probably her son, Prince Michael II "Blanket". - There were busted several rumors regarding Michael's health and career. - And King Of Pop, album that was created by the fans who by voting were choosing as favorite to be issued on album (every country individually). - A leak to Internet song Hold My Hand recorded in duet by Michael & Akon, and doesn't issued by the fact of leak. - There was announcement about issuing two MJ dolls, it's Thriller Style, which will be available in limited edition only in Japan and Hong-Kong, and Billie Jean style doll. - Michael has sold "Neverland" ranch for $35 millions and also he gave stuffs from Neverland to auction, the auction take place in April 2009. - Michael had been nominated to "World Best Pop Male Artist", award wasn't won by him. - DVD Box was issued in Europe: Number Ones - Live In Bucharest: The Dangerous Tour. - Album The Essential 3.0 was issued. - Michael appeared and supported Chris Audiger the fashion designer. - And this year was the third anniversary of Michael's acquittal. More than that Michael another time resize thank of the fans amount of sold albums, just Thriller is sold in more than 108 millions copies, all other albums after it over 2 millions copies more. However year 2009 it seems to be not little as more exciting after Michael's and his spokesperson announcements it looks like to be making ready the thing we all are waiting for... Michael on the stage. So stay tune! The writer's wild allegations concerning Mr. Jackson's health are a total fabrication. Michael Jackson records sells! In company with Beyonce, Elvis Presley and the Beatles, his records have sold approximately 1.4 millions copies in 2008. He has never lacked creativity when it comes to fashioning a disguise. Michael Jackson were caught shopping in an LA antique store the other day wearing a fedora and a Zorro-like black mask. Michael Jackson is set to auction a selection of more than 2000 personal items from Neverland in April 2009. Julien's Auctions will be hosting the once in a lifetime auction, and a portion of the proceeds will go to MusiCares. The auction will include items such as the iconic gates of Neverland, Michael Jackson's glove, paintings, sculptures and memorabilia from the life and career of Michael Jackson. Beginning February 15th, 2009, bidders will be able to place proxy bids, register for the auction and explore the history of the more than 2,000 lots in this historic auction by visiting www.juliensauctions.com. The 5 day auction will take place April 21-25, 2009. Michael Jackson settled the case against Sheikh Abdullah bin Hamad al-Khalifa. "As Mr. Jackson was about to board his plane to London, he was advised by his legal team to postpone his travels since the parties had concluded a settlement in principle," a London spokeswoman for Jackson said on Sunday. That means that Jackson will not meet in court today. Date: November 21, 2008 Quincy Jones: "He's a part of my soul"
In an interview with BET.com Quincy Jones sheds light on Michael Jackson comments.
" I didn't state that I didn't want to work with Michael Jackson, I stated that I have too many projects to work with Michael, big difference", Quincy told BET.com this week. Quincy Jones, who has worked with many great artists like Ray Charles, Aretha Franklin, Duke Ellington, Paul Simon, Frank Sinatra, not only expressed his love for the one and only King of Pop, but also noted a hectic schedule would prohibit complete focus on Jackson's comeback set.
" I love Michael; he's a part of my soul, but I got nine movies, three albums I'm in the middle of, my foundation and my kids; I have a lot to do. You have to focus on everything you do or you don't do it well", said Jones. "The Complete Quincy Jones: My Journey & Passions", his new memoir, we can now take a look inside the life of the legendary producer. Quincys accounts and reflections are easily viewed as some of the greatest memories in music industries. When BET asked to recount his favourite, Jones had no intentions on naming just one. In recent developements, it is now clear that Michael Jackson will personally show up in court. Sheikh Abdullah bin Hamad al-Khalifa, the second son of the king of Bahrain, is suing Jackson for allegedly reneging on a deal to record a new album, write an autobiography, for given him a car, vacations among other things which Jackson claims were only gifts. Jackson's lawyer Robert Englehart had initially argued in London's High Court on Tuesday that the singer was suffering from an illness and should be allowed to provide evidence. Now Jackson have decided that he will show up after all. The court starts on Monday. Michael is expected to arrive in London over the weekend to give evidence on Monday afternoon, 24th November. In London High Court, Abdulla Bin Hamad Bin Isa Al-Khalifa, The King of Bahrain's son, is said to have planned to revive Michael Jackson's career with songs he personally had written. He also gave Jackson financial support, his lawyer said. The Royal is suing Jackson for 4.7m for reneging on a music contract which would have paid back the loans. In the 12 day hearing an application has been made for Jackson to give evidence from the US via a video link. Jackson and the sheikh had a "close personal relationship" during Jacksons visit there three years ago, the sheikh's lawyer Bankim Thanki told the court. Together with his three children and his personal staff, Michael Jackson travelled to Bahrain at the sheikh's invitation shortly after beeing cleared for all charges to relax. Prior to his stay, Sheikh Abdulla set up Jackson with a recording studio on his Neverland ranch and sent him his own musical compositions. According to the sheikh's lawyer, a recording of a finished song will be played in court. The court heard that under the agreement, an album, autobiography and stage play were to be produced. In 2006, plans were announced for the star to release a new album on a label based in the Gulf state and owned by Sheikh Abdulla. The sheikh claims that despite having paid the $2.2m cost for Jackson to record a song intended to benefit the victims of Hurricane Katrina, the singer failed to attend the studio for the final recording and the song was never released. He also says he paid for and built a recording studio in Bahrain for Jackson and himself to make recordings together. In addition, he paid all the singer's living, travel and other expenses until his departure from Bahrain in May 2006, and advanced funds to retain legal and financial advisers. Jackson has contested the claim, saying there was no valid agreement, adding the sheikh's case is based on "mistake, misrepresentation and undue influence". He has also said no project was ever finalised and payments were "gifts". The singer has admitted that he signed a document which he understood gave him a substantial shareholding in the 2 Seas recording company. But he challenges the sheikh's description of him as "an experienced businessman" and says he never read the terms of the document and was never advised to take independent legal advice. He also claims that the sheikh, a powerful and influential public figure, exercised "undue influence" over him when he was emotionally exhausted after his highly-publicised criminal trial. Michael Jackson has sold Neverland Ranch to a Delaware-based corporation for approximately $35 million, although the King of Pop retains an interest in the property. The infamous property north of Los Olivos in Santa Barbara County was transferred from Jackson to Sycamore Valley Ranch Company LLC, which formed in mid-July, according to documents from the county assessors office. Sycamore is a joint venture between Jackson and an affiliate of Colony Capital Inc., a Los Angeles-based company that purchased the entertainers $24.5 million mortgage on the property in May, according to a source close to the deal. The pop stars private amusement park and home at 5225 Figueroa Mountain Road opened in 1988 and consisted of 2,800 acres. Prior to that, it was a working cattle ranch owned by Bill Bone, a developer who has his own connections to Colony Capital. A notice of default from a San Francisco title company was served in November 2007 suggesting that Jacksons ownership of the ranch could be at risk. And a foreclosure auction in May was canceled after Colony Capital LLC purchased the multi-million loan. Jackson has struggled to pay his debts in recent years after his financial empire crumbled following his arrest in 2003 on child-molestation charges. A jury later acquitted him and he reportedly hasnt lived at Neverland for the past two years. On the eve of the World Music Awards Show to open up within 22 hours in Monaco we have learned that Michael Jackson has been nominated for World Best Pop Male Artist. He is running against Kid Rock, James Blunt, and Enrique Iglesias. The reason for the nomination would be because Michael Jackson released Thriller 25 earlier this year on February 2008.Note of Thriller 25 is: 2,238,500 Worldwide Sales. It is unknown at this time if Michael will make any kind of appearance live or in video if he decides to do so if he wins this nomination. Good Luck Michael from your fans from MJJC! There is no word as to when the World Music Awards will be aired in the United States and other countries. The event will broadcast in the USA December 2nd on MyNetworkTV--and will air live in the Middle East and Africa. It will air in Ireland on Sunday, November 16th on RTE 2, and will air on Channel 4 in the UK, November 21st (with a repeat on T4). Please check the thread: World Music Awards on General Discussion 1 for any other information. The disc jockey thinking it was an impersonator also played "Thriller" as Michael Jackson walked in the room. Jackson came to Maines party with the wife of the late actor Gregory Peck, one of Jacksons longtime friends. Seems as though the biggest thing to ever hit the music industry and broke all kinds of records will be hitting the Broadway scene. Thriller Live, which is a tribute based on the hits of Michael Jackson and the Jackson 5, will be hitting the Broadway scene on January 2. There are auditions being held for a Michael Jackson look a like between the ages of 11- 15 years of age starting November 23. The casting session will take place the Lyric Theatre, which is where the production will be staged next year. The show has already been seen in Germany, Holland and Scandinavia and travelled on three UK tours. Michael Jackson was sighted and photographed leaving antiques store, 'Off The Wall', November 3rd. This is the second shopping trip to the store in the last fortnight, and this time he was snapped with his son, Blanket. More pics in "New Gallery"
Michael Jackson issued a statement on the 30th of October regarding the Jackson 5 tour rumours and his new projects. Michael Jackson was spotted for the forth time in a week in Los Angeles. Reportedly, he attended a costume party with his children in Hollywood on the 29th October. Michael was dressed conservatively, while his kids were dressed in masks for the party. Michael signed autographs for waiting fans as he stepped out of his SUV. Michael Jackson was photographed while shopping at Aahs! Gift Shop in West Hollywood, 28th October. Reportedly, he purchased gifts for his children, among several other items. Michael Jackson was spotted shopping at several stores in LA, Thursday 23rd October. Reports say he was at an antiques store, a cosmetics store, and Sharper Image. Michael reportedly purchased a model aeroplane and spa products before paparazzi and fans descended on his trip. Michael signed autographs and smiled and waved at fans before leaving in his SUV.
" I've only had a couple of run-ins with Michael. " " I wrote a song with Will.I.Am. that we submitted to him that he may or may not use for his new album." " I have no idea what the staus of that album is - if it's still in the works or temporarliy on hold or anything." " I've had no communication from him. I dont even know if he's still working on an album "
" I have a suspicion that it's not happening "
"There's all these artists in the world like Neo, Chris Brown and Usher, Justin Timberlake, Fergies and Rhiannas and then there's Michael Jackson. "Michael Jackson has a different pace and you can not put Michael Jackson in that category especially when a lot of those artists have been inspired by Michael Jackson." "So Michael Jackson is gonna release his record when he releases his record." Q: So we've seen the tidbits of info about it, but is it true you are working with Michael Jackson on his new album? A: Yes, to what capacity that I don't know. A: Well Michael work ethic has always been really high, but yeah Michael contacted people he wanted to work with, they have people that think could participate, and so on. Then there are independent musicians trying to get a hold of Michael. Tapes slipped here and there.. It's endless. His options right now, are increasable. If he were just to release the album now he would not be happy with it. A: No, it's not that, but for the album to reach it's potential, he needs to listen to every track, experiment with them, see where he can take them. With Michael a track is never finished. There is always something to fix. Q: How would you describe the sound he's going for? A: Anything Michael does always have the Michael Jackson' sound. Of course he wants to use current technologies, and specific sounds that are really big right now, but he makes sure the melodic flow of the whole thing is timeless. A: Oh yeah, it's always like that. Most people don't know that I worked with Michael for the HIStory album too. But our tracks did not make the final cut of the album. So many people are trying to get on Michaels album. I'm not sure if they have gotten the chance to or are scheduled to, but everyone from Chris Brown, T-Pain, R. Kelly.. I heard Kelly created something like 15 to 20 tracks just for Michael and has had it for years just waiting for the opportunity to give it to him. Um Pharrell, Sean Garret... I mean Everyone. A: I don't know if he will do the whole big travel thing again. He'll defiantly be performing though. He couldn't stop dancing for anything. Pick up your copy next Tuesday at Amazon, Newbury Comics and Virgin Megastore. Check back to Michael's official website for buy links. Voted 100.000 people, 120 songs to choose, 20 days of voting, 2 CD, 1 King Of Pop! In decision of polish admirers and fans of music and vocal of talent of Michael Jackson in voting it was announced by SONY BMG and media partners (Radio ZET, Polska The Times, Empik.com and Onet.pl) was found more than 30 compositions from Jackson's artistic works. In result of plebiscite is double CD "KING OF POP", which contains in 100% favorite songs that got most votes during internet sonde. In addiction, only in EMPiK shops and on the website www.empik.com is available version of CD album with no before published Thriller MegaMix 2008 by Jason Nevins. 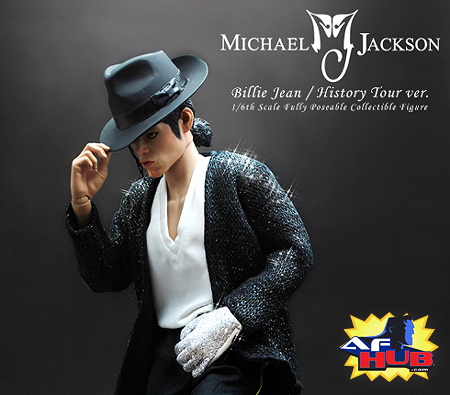 A new official Michael Jackson Billie Jean (HIStory Tour version) Figure is set for release in Japan December 2008! Hot Toys proudly announces their latest addition to their ever growing M Icon Series - the Michael Jackson (Billie Jean / History Tour version) collectible figure. This figure stands approximately 30 cm tall and bears the distinct likeness of the legendary musician and Hollywood pop star in the 80s, Michael Jackson. * Hot Toys newly developed TrueType Slim version body with over 38 points of articulation. Beginning this of this week Michael was seen out and about with his family. It was reported that he stayed in Chicago overnight with his children in the Gold Cost hotel where they just stayed in and relaxed on Monday. The following day his entourage drove him to Gary, IN where he took a tour of his childhood neighborhood in the northwest Indiana city before flying out of the area via private jet. On Wednesday, Michael was seen in Las Vegas at the Las Vegas Hilton where he and his children were eating at the Benihana. The executive chef Toy Tomme personally cooked for him and his children. A company called BT Bear has been painting bears since 1999 with the concept of not drawing cute bears but "bad taste" bears. Now with a collectors club the Bad Taste Bears are a phenomenon. With the launch of the 25th anniversary of Thriller the Bad Taste Bear Company is making a bear called BTB Zombie for attendees of the BTB Autumn event. There are only 400 pieces worldwide so there arent very many to go around. On ordering the ticket for the Autumn event you will have the option of purchasing the figurine- the bear is limited to 1 person, which means it can only be obtained by preordering with the ticket and then by attending the event. Event Gift - On entrance to the event you will be given a goody bag, including an exclusive Lucifer enamel badge in a flocked black presentation box and event certificate. In an interview on the Ellen DeGeneres Show, Pamela Anderson denied reports that she and Michael Jackson were dating. However, she did confirm that they had met, and that Michael Jackson wants her for a video. "He just wants me to be in a video," she said on The Ellen DeGeneres Show Tuesday when asked about her recent meeting with Mr. Jackson. "My life is so interesting. My life is a blur." "So seriously, have you been hanging out with him?" DeGeneres asked. "It happens ... skin cancer and Vicodin," she replied. "I don't know ... I have a lot of interesting friends." "I love you all from the bottom of my heart. You're a quintessential part of everything I do, of everything I create. I feel your purity and innocence from all across the world. I feel your love and it inspires me to create music every day. You inspire me and I remember everything that you do. I love you all so much." "Know that I truly love and appreciate all of you, from the bottom of my heart. Polish dancers of Eurovision: Edyta(Edith ang.) Herbus and Marcin (Martin ang.) Mroczek have been danced in Eurovision to 2 Jackson's songs: first they were slow dance to "Whatever Happens" and later they did speed up pace to more fast dance to "Black or White" song. I additionally Marcin (Martin ang.) Mroczek put white shirt, black pants, white socks and black shoes, more than that polish dancers did some dance moves of King of Pop like: standing up on fingers and position of bow from "Smooth Criminal". Finally polish dancers won this program. In peer from Austria, he did Jackson's classical move: Moonwalk. On August 26, Motown re-released a two disc CD with over 30 Michael Jackson and Jackson 5 songs. Michael Jackson Gold. Digitally remastered, this double album covers many of the early years in Michael Jackson's career with his brothers and his early solo projects. It should be for sale world wide. According to the booklet in Michael Jackson Gold, Motown is also planning on releasing a 3 CD album called "Michael Jackson, Hello World : The Complete Motown Solo Albums". The solo albums he did with Motown, Got to Be There, Ben, Music & Me and Forever Michael, will all be remastered for this upcoming release. Date is yet to be announced. Sony-BMG is releasing Dangerous CD along with 'Dang. the short film' DVD as part as a new CD+DVD greatest hits series of different Sony artists. Release date: September 22. Some very lucky Michael Jackson fans from Europe were rewarded for a long wait last week. On Wednesday, after having dinner with his three children at Planet Hollywood restaurant at Caesars Palace, Michael Jackson told his driver to stop the car to sign autographs to the fans who were waiting for him. Through a back window the waiting crowd got their rewards. On Jackson's 50th birthday, two nights earlier, the same European fans, along with two dozen others, gathered outside his home while singing Happy Birthday at 11 p.m. They had brought balloons, a birthday cake and presents, which the security took inside the house. As did many times before, Michael's security delivered six pizzas to the fans on two separate days. Date: August 29, 2008 Michael Jackson's 50th Birthday! Dear Michael: All the best and Happy 50th Birthday! "Just have a little cake with my children and we'll probably watch some cartoons -- before getting right back to work. Oh boy, that's a hard one," he said, before singling out "We Are the World," "Billie Jean" and "Thriller." But Jackson was not content to rest on his laurels, saying, "I am still looking forward to doing a lot of great things." He hopes to release new music and tour, though he doesn't have dates set. "I am writing all the time," he said. "I love composing and the whole thing. But I am also raising my children and enjoying it and teaching them to ride bicycles and how to read. I love it." Asked if he'd like his two sons and daughter to have the same sort of upbringing as him, he said he'd prefer to let them "enjoy their childhood as much as possible." "I let them go to the arcade and go to the movies and do things," he said. "I want them to get to do the kind of things I didn't get to do. So, I fill them with a lot of enjoyment that way -- a lot of amusement. You know? "I get pretty emotional when I see them having a wonderful time," he added, "when they are on a ride and they are screaming and they are happy. ... It makes me emotional, 'cause I see they are having a real good time." Jackson said his kids "love music ... they are very much into the arts," but that, "I don't push them." Does turning 50 mean he now has an AARP card? "Not that I know of!" Jackson said, laughing. "You never know. They can find you wherever you are." He said he still can do all his famous dance moves and "more." "I feel very wise and sage, but at the same time very young," he said. He said he hopes to "be myself" in his future work, but also that he is "inspired by many great artists," noting he wished he could have worked with Brown or Fred Astaire. He said he sacrificed his childhood with "a lot of hard work," and that he remembers "giving up your life for the medium." But he'd do it all again. "I think I would," he said. "It is very much worth it. I have always loved show business and have always enjoyed making people happy through that medium. I love the celebration of music and dance and art. I just love it." If he could go back and give himself some advice at age 9 or 10, the approximate age of his oldest children, he would advise himself, "if you are going to do it, commit yourself, know your craft and be really involved." He'd say to be strong and to have "rhinoceros skin" when it comes to dealing with the pressures of fame. "Michael is such a perfectionist in everything he does, every detail is perfect. It's all ear candy. Me and Akon were watching him work in the studio, laughing like little children." "He is a super nice and polite guy. I was shocked when I had dinner with him, he is so knowledgable about so many things, a real business man, and very intelligent." There have been pictures circulated of him in a wheel chair. Is he okay? "It is not at all as we read, and Michael does not care what they write. If he was as dumb as is said he would not own half of the Sony and Beatle's catalogs." "It's very melodic. Very pop. I have no idea when his album will be out. He works with a line of different producers." Fans will have opportunities to win prizes by playing new online game. Starting August 22, fans can now compete with their friends on their own network, and with users on the other two. This cool competition is the first to run across all of the three major social network sites. The game will allow users to control the King of Pop's legendary dance moves as they aim to keep up with the steps during his tracks in a dance-mat style routine. By the use of arrows it will direct users to try and build up the biggest combination of moves they can. Prizes will be awarded for the highest hourly and daily scores, such as exclusive ringtones for hourly winners, and limited edition iPod Nanos for the daily winners. The lucky moonwalker overall winner will have the chance to win two round-the-world plane tickets, a state-of-the-art TV or Playstation 3. The contest coincides with the release of the King of Pop album, a record made up of top Michael Jackson hits as voted for by fans. In a recent interview Ne-Yo says he met Michael Jackson when they discussed the working on Jackson's new album. "It was very exciting", Ne-Yo says. "Michael Jackson is one of the reasons why I sing". He goes on and say that when they met he was really cool and really regular people. "Everyone expects Michael Jackson to be this weird guy and he's not. He had a regular suit on. There was nothing weird about him. We talked about music, where he wanted to go direction-wise, how we'd get the records to one another. It was a very calm, regular meeting", he says. According to Ne-Yo the concept for the album is to turn the focus back on Michael Jackson the musician. "We're trying to get people to ignore the rumours about his personal life and get back to the reason why we loved Michael Jackson in the first place, the entertainment value," Ne-Yo says. "We want to get the music right. He's still dancing, doing his thing; it should be good." Japanese mobile operator Softbank will release a Michael Jackson mobile phone on August 29 to celebrate Jackson's 50th bday. The MJ mobile phone will be sold under license of Ecbizz Japan and Triumph Int. Usa, a Michael Jackson's company created back in the '80s to sell Jackson's official merchandise. So far black and white versions have been revealed, but a third edition is expected to be sold as well. Owners of the MJ mobile will be able to download multimedia content from this page of mobile content portal Coraboruta. In Neversoft's upcoming rhythm sequel Guitar Hero World Tour, Michael Jackson's 'Beat it' is among the newly confirmed songs that have been listed in a preview of the game in Stuff Magazine. With songs from bands like Nirvana, The Beasie Boys, Muse, The Doors, Linking Park and several others, Guitar Hero World Tour is scheduled to arrive on PS2, PS3, Xbox 360 and Wii this fall. RedOne and Akon are among the producers that Michael Jackson is working with on his long awaited album. "It is anyone's guess as to when the album will be out. It's not like it's a secret, it's just that nobody knows," says the super hot RedOne (nee Nadir Khayat). RedOne describes how it is working with Michael Jackson: "When it comes to Michael, I'm not allowed to talk about the recording," he adds. But I can say he's unbelievable, honestly the best that music has ever known, the ultimate star, artist, musician. Every other star I work with, I tell them I'm working with Michael Jackson, and they're like 'Oh, my God!' And when I tell him, he's so humble and polite, he's like, 'Oh, thank you.'" The end result of MJ's work with Akon is quite interesing, as said Akon to MTV.com news, "That was a dream come true," on Tuesday. In addition made together by Akon and Michael song "Hold My Hand" which leaked to internet will be included on Akon's and Jackson's new album. Akon also said Jackson would be appearing in the video for "Hold My Hand," which is the lead cut from 'Kon's next LP, Acquitted. "He's fully committed," Akon said about MJ being in the video. On August 28, 2008, the day before the moonwalkers 50'th birthday, Sony BMG USA will release a new CD; The Essential Michael Jackson 3.0. The album will include the US version of the 2005 release The essential Michael Jackson + Bonus CD. The limited collection CD will include hits like Say Say Say, featuring Paul McCartney, They Don't Care About Us, Jam and Stranger in Moscow. It will also include some rare songs like Can't Get Out Of The Rain from The Wiz musical he did with Diana Ross in 1978, Butterflies from his latest album Invincible and One More Chance, produced by R. Kelly. Date: 27.07.08 Could Gary Finally Get Jackson Family Museum? A museum dedicated to the most famous family could be developed soon in Gary, Indiana. Jospeh Jackson was in Gary for a new reality show about the family. Posters taped to Gary's City Hall doors said "Come meet Joe." Mayor Rudy Clay led the charge. Clay talked about plans for a home for the musical family's memorabilia, which the idea failed before. We had to get a commitment solid from Joe here today. We got that on camera," Clay said. Asked whether he got the commitment in writing, Clay said, "Let me put it like this, the paperwork has to come after the commitment. The developer wouldn't speak with us on camera, but said the museum would be near Grant Street and Interstate 80/94. She also said the project's in the earliest of stages, but would be privately funded. Joe Jackson said he was lending his approval to it, but was not promising to help finance it. An artist's rendering of a possible Jackson Family museum in Gary, Ind. Ne-yo is about to launch his 3rd album and has made his homage to Michael Jackson in that album. "Anybody who has been following Ne-Yo from the start knows that I'm a huge, huge Michael Jackson fan," the singer explained. "And love is one of the few things on the face of this planet that will never go out of style." This song that is paying homage to the King of Pop is called "Nobody" ,which will be on his new album Year of The Gentleman. When Ne-Yo played the track for Jackson, with whom he's currently working, he got a positive response. "He told me that he likes the way I do Michael Jackson," Ne-Yo beamed. "I asked him what he meant by that, and he said, 'When you do that, it doesn't feel like you're trying to copy me or trying to be me. It feels like you're complimenting me.' And that's what I'm doing. It means the world that he liked it." This time rumors are confirmed, Michael Jackson and Akon made fantastic duet together in new Akon's track: "Hold My Hand". Ed Hardy's Christian Audigier has confirmed to People that he and the King of Pop are going to launch a clothing line: "It's the merging of the King of Pop with the king of fashion. Something explosive is going to happen." Michael Jackson is an international pop icon who has had a huge following throughout his career," he said. "I think people will think it's hip to wear his line. Through all his ups and downs people still love him. He still has a huge fan base." Before Martin Bandier agreed to become chief executive of Sony/ATV Music Publishing he had one thing on his mind and that was Michael Jackson. As half owner of Sony/ATV, Michael Jackson has a hold of half a million songs and 200 Beatles classics. The managment of Sony/ATV on Michael's part has been put to the test due to his legal troubles. "If I wanted to do a deal, I had to have the flexibility to be able to close it quickly," says Mr Bandier, one of the creators of the modern music publishing industry, as he recalls his concern. Michael Jackson and Martin Bandier has done buisness together before back in 1993 when he was head of EMI Music Publishing, Mr Bandier paid Mr Jackson a record $70m advance for the right to administer his ATV Music catalogue. As part of the deal, Mr Bandier also agreed to sell three of his favourite Elvis songs to the singer, who was then dating Lisa Marie Presley. This was no small concession for a self-described "song junkie". It is unclear whether that favour figured in Mr Jacksons thinking. But, after a brief phone conversation last year, Mr Bandier was put at ease. "For me, its a piece of cake," he says of the relationship, still chuckling at Mr Jacksons insistence on calling him "Mr Bandier". "To his credit, Michael has given me a green light." As Mr Bandier recounts it, the episode is of a piece with his happy tenure at Sony/ATV. With two sizeable acquisitions, he has begun to increase market share at the fourth-largest music publisher. He enjoys the backing of a supportive boss, Sony chief executive Sir Howard Stringer. Today we're celebrating the 3rd anniversary of Michael Jackson's vindicate. After 4 months and many hours of testifying of witnesses as also 10 days of jury deliberation, we can today celebrating the 3rd anniversary of Michael Jackson's vindicates. 13.06.05 The jury said 14 times: "NOT GUILTY". Michael Jackson and his family came into courthouse after they were informed about the verdict. Despite of delay of Michael's appearance into the courthouse everything was all right. Michael finally had heard it's over, he is a free man. Jury did not believe in prosecutor's and accuser's story. That day the justice was done. A whole history of the trial you can find here. Being fans of Michael Jackson we always run into rumors and false stories all the time. Well this one about Michael having stage fright is just one of thousands of stories that have run it's course in the internet. No other than a tabloid, The Sun, was the first to report that Michael had canceled a performance for "American Idol" within 24 hours due to stage fright. Simon Cowell, which is one of the judges in American Idol, rebutted the story on Friday when asked about it on BBC2 radio show 'Steve Wright In The Afternoon'. He replied, " Not true, not true. We hear those rumours all the time." Cowell also stated that they would be happy to have Michael Jackson on the show some time. Essence.com: Sorry to hear that you were put through the ringer. You also wrote "The Man in the Mirror" for Michael Jackson and recorded the duet "I Just Can't Stop Loving You" with him. How is he and have you spoken to him? S.G.: I dont know and no, I havent spoken to him since I toured with him. I spent more time with him when we recorded the duet, but I dont talk to him all the time. I spent more time when we recorded the duet because we did it in French, English and Spanish in all these different languages and saw him every night for two hours. Essence.com: So you two never spoke the entire time you worked together. S.G.: I think he is the most talented artist on the Planet. Ive toured with Madonna and there is no one--aside from Quincy [Jones]--whod I tour with again except Michael. It was so much fun. He was so amazing. We saw him every night there were some nights we were on stage clapping like wed never seen him before and we worked with him every night and the man is just incredible. His shows take two day to have the set built and he needs about that much time to regroup and rest so Michael only performs twice a week. Madonna? I was on the road for three months and practiced everyday, all day. Essence.com: Did you two get to hang out at all? S.G.: No, wed go to different cities and the next day wed read the newspaper and learn what he did in that city. Other than that I saw him in rehearsals. Im hearing rumblings that he might be back on the road so I just put my lil name in the ring. S.G.: Awesome, truly. Michael has a really acute sense of humor. Hes very funny, but hes also a perfectionist. And serious about his artthe singing and dancing. When I did the duet with him I didnt know him. I just happened to be in the studio for the second day working on "Man in the Mirror" and Quincy asked me what I thought about the song. I told him it was cool and then he asked me to lay down some vocals in the booth. So I go in and the next thing I know he tells Michael to join me so he does and starts facing me at the other stand and singing. Im trying to be all serious and Michael starts throwing peanuts at me, but Quincy doesnt see him so everytime Id start cracking up Quincy would be like, "Siedah youre wasting studio time!" And Michael is over there just cracking up. He has a great sense of humor and is like a big kid. Last night many celebrities attended fashion designer Christian Audigier's 50th birthday party at Petersen Automotive Museum in Los Angeles. But without doubt the climax of the party happened when Michael Jackson surprisingly appeared onstage as he was introduced by Audigier as "The King Of Pop". Superior Court Judge Soussan G. Bruguera rejected a new trial for the Santa Monica based air charter,Xtra Jet, who was ordered to pay $20.25 million for secertly taping Michael Jackson and his lawyers as they flew to Las Vegas back in November 2003. Date: 19.05.08 Michael Jackson to sue "The Pirate Bay"
Michael Jackson is among the list of some musicians who are to sue the largest Bittorrent website, "The Pirate Bay". The list of artists is not ready yet but the compensation claims will amount to more than $100 million ($619 million)," Web Sheriff President John Giacobbi told E24. Giacobbi was in Stockholm on Friday to meet with Swedish lawyer Lars Sandberg, who has been hired by Web Sheriff on behalf of the musicians. Giacobbi said he was also keen to have Sweden's must successful ever pop stars on board. "I have tried to get in touch with the members of Abba. It would be great if they too were interested in having their case tried. They are the best symbols for Sweden after all, unlike the founders of The Pirate who steal music and have given Sweden a bad name," Giacobbi told E24. Pirate Bay founders Gottfrid Svartholm Warg, Fredrik Neij, Peter Sunde and Carl Lundström have all been indicted on charges of being accessories to breaking copyright law. On a recent interview with London's Heart radio station, Victoria Beckham, has revealed that she has gone to Michael Jackson's Neverland Ranch. She stated that Neverland is a nice place for families to go and visit. This is what Victoria told London's Heart radio: "I've been to Neverland with the kids. I'm not going to say if Michael Jackson was there. It was amazing and I have met Michael Jackson and he's a very nice man. What I thought was really nice is there's pictures of family everywhere and that's what I mean about a lot of these people are actually really nice and just the same as everybody else. They've got pictures of kids up everywhere, which I think is really cool. Pictures of his kids!" The Library of Congress' National Recording Registry has inducted "Thriller", the best selling album in the world, for it's cultural significance. The Library of Congress chooses 25 recordings each year to add to its registry and preserve. Nominations come from a Library of Congress preservation board and online suggestions from the public. The selections for 2007 bring the registrys total to 250. We have just learned from an article posted on the Bloomberg.com website that Neverland has adverted foreclosure due to a company named Colony Capital LLC has bought the loan on the property. It states that the person which is headed by the company, Thomas Barrack, purchased the loan from Fortress Investmant Group LLC and is also in talks with Michael Jackson. This is an exclusive report about Neverland's public auction that was supposed to take place on May 14, 2008 is now cancelled, which was cancelled on May 9th, per the official auction listing registry at Priority Posting. Our fellow member of MJJC (TSCM) had reported last month that Michael Jackson cleared up the final county -imposed tax lein on his property by paying off $13,374 in owed taxes. There are no further details on the cancellation of the auction. According to court papers filed on April 14th Michael Jackson has dropped the lawsuit he brought against the accounting firm of Bernstein, Fox, Whitman, Goldman and Sloan back in Dec. 2006. The suit originally claimed negligence and breach of fiduciary duties. Alleging the firm had not paid workers' compensation payments in 2004 and 2005 and was late paying taxes he owed, in addition to hiring people and entering into contracts without his permission. The accounting firm had responded by countersuing Jackson claiming he owed one million in unpaid dues however that claim had already been dismissed. The papers filed did not say if an agreement had been reached between the parties involved or otherwise. Michael Jackson's name has been taken off the Marian lawsuit for alleged intentional infliction of emotional and mental distress by Jackson, Marian Medical Center and Catholic Healthcare West. The suit was filed by the Ruiz family of the woman who died in the hospital on February 2005. Superior Court Judge Rodney Melville granted a demurrer today that was filed by Jacksons attorney, Timothy Gorry, of Los Angeles. Allegations remained against the hospital. Website MSN will air the Dangerous concert that was filmed in Bucharest back on 1992. The airing of the concert is in celebration of Michael Jackson's 25th anniversary of Thriller. Live in Bucharest: is the only concert ever recorded for live broadcast. The concert will be aired on website: http://msninconcert.msn.com/music/Mi...gb/artist.aspx on Thursday, April 3, 2008 8:00 p.m.. Please keep this date clear to watch this HIStoric concert. Cult remastered edition of Michael Jackson's CD is certified Platinum in poland. CD has been realised in three version in country - "Thriller -25th Anniversary Edition" (Classic Cover), "Thriller - 25th Anniversary Edition" (Zombie Cover) and "Thriller -25th Anniversary Vinyl Edition". CD album as far is certified Gold in: Australia, Belgium, Canada, France, India, Italy, Irleand, Mexico, Norway, Sweden, Switzerland, England and USA. A member by the name of drsh83 has informed us of something disturbing that they found in their home country Malaysia. This thing that is disturbing is a fake Michael Jackson cd that is said to be his new album called 7even. Drsh83 stated that the so called new album was right beside Thriller 25 in a local cd shop. Drsh83 continued to say that in Malaysia there are alot of pirated cds and dvds that people sale, which is not uncommon in any country at this day in age. Buyers be aware of what you buy regardless if it's on a website that you trust or a store. It may look authentic but if Michael Jackson or a reliable source doesn't state or give out a press about a release then it's probably not real. Last nights news about Michael saving Neverland from foreclosure had everyone sighing a relief. Now on another twist of events today it seems as though Michael wants Neverland sold. According to the AP, report states that the mutal agreement between Michael and his creditors have two options, which Micheal could refinance Neverland or sell Neverland. "That allows us to refinance or sell the property," Jackson's attorney, L. Londell McMillan, told The Associated on Friday. He added that Jackson is looking at both options. Besides AP, reports that Jackson, who moved out of Neverland more than two years ago, bought the property in the bucolic rolling hills of Los Olivos, 150 miles north of Los Angeles, from real estate baron William Bone in 1988 and turned it into his personal playground. He brought in more than a dozen amusement park rides, including a merry-go-round, Ferris wheel and roller coaster and installed a zoo complete with flamingos, giraffes, elephants and orangutans. The civil case against pop star Michael Jackson and Marian Medical Center may not happen, according to the defendant's attorney. The family of Manuela Ruiz says the 74-year-old patient was pushed out of her hospital room to make space for Jackson back in 2005. Ruiz later died. Maria Ortiz, along with Rosa and Marcos Meraz, are suing over what they say was preferential treatment. But the plaintiffs did not appear in court Monday. The hospital's attorney says they have not secured a lawyer. "Patient care and safety is always our first priority at Marian. We have always been confident the care provided to Mrs. Ruiz was exceptional. We continue to express our sympathy to the Ruiz family." A judge has ordered the former owner of a charter jet company to pay uber-attorney Mark Geragos and an associate lawyer $2.25 million for secretly taping them and Michael Jackson aboard a chartered plane as ***** was en route from Vegas to Santa Barbara to surrender to child molestation charges in November of 2003. Geragos filed suit against the XtraJet, claiming the company videotaped the flight and tried to sell the tapes to the media for a sum in the high six figures. The lawsuit claimed this violated Jackson's right to privacy. FOX News reported back in November of 2003 that the network had viewed the tape without audio and it showed a calm and often smiling and laughing Jackson drinking a soda and, at one point, spraying cologne. Geragos had called the taping "one of the most outrageous acts I've seen in my 20 years of practicing criminal law." A Jackson source stated that Michael Jackson's Neverland Ranch will not be auctioned. The real estate source stated there are other options for Jackson to choose from including selling the ranch directly to another party or making a payment on his $24.5 million Neverland debt that would satisfy the trustee. After a quarter century of the original Thriller being released it has made it to the #2 spot as the Best Selling Album according to the Billboard charts and has sold 166,000 copies in the United States. Thriller 25 is also #1 in theTop Pop Chart. The newly expanded deluxe 25th anniversary edition of Michael Jackson's Thriller was ineligible to chart the Billboard 200 since it is 18 months or older. Jack Johnson's 'Sleep Through The Static' has maintained its number one position for a second week in both Australia and the UK despite competition from the reduxed Michael Jackson album 'Thriller'. Thriller debuted at number two in Australia with sales of 12,790 units but that wasn't enough to beat Johnson's 16,463 units winning score. In the UK, 'Thriller' came in at number three behind Johnson and Nickelback. 'Thriller' has been reissued to mark its 25th anniversary. Jackson has created new 2008 mixes of some of the classic songs with Kanye West, will.i.am, Fergie and Akon. 'Sleep Through The Static' is Johnson's 5th studio album. Date: 17.02.08 Sony will realise Japan collection of: "Thriller 25 Anniversary Japanese Single Collection"
Pop superstar Michael Jackson will appear at the Grammy Awards on Sunday, but he won't be singing at the ceremony. Jackson was rumored to be attending the Los Angeles bash to promote a 25th anniversary re-release of his seminal album, Thriller, and organizers were keen for the star to duet on hits from the LP with a number of contemporary performers, including Will.I.Am, Akon, Kanye West and Fergie. But Jackson, who hasn't performed live in seven years, was reluctant to take on such a big project at short notice. A source tells the New York Post, "Michael can't go along with that. He needs more time to rehearse new versions of the songs. And everything requires new choreography." The Post reveals that Grammy producer Ken Ehrlich backed down and consented for Jackson to just appear onstage. The biggest selling album of all time went underground last week when London commuters were taken by storm with a performance of the famous 'Thriller' dance on the London tube. The video shows passengers looking flabbergasted as the impromptu performance by fellow commuters kicks off. "The polite applause at the end is the best bit - very British." The dance was performed by professional dancers from 'Thriller Live', who got together with Sony BMG to plan the 25th anniversary of the release of Thriller and thought it would be fun to perform the 'Thriller' dance in various locations around London. It's not every day someone calls 911 because Michael Jackson's "Beat It" was playing on the radio. But when Z89 put the song on repeat for 24 hours starting midnight Monday, "people just started freaking out," said sophomore Lauren Levine, who has worked at the student-run station since her freshman year. The Syracuse University station received as many as 75 instant messages, e-mails and phone calls from listeners asking what was going on. Levine, a broadcast journalism major, described Z89 as a very generic Top 40 station. But it is currently switching from "No.1 for Today's Hit Music" to "The Beat of Syracuse." The radio station chose Michael Jackson's 1983 single "Beat It" to introduce the new theme of the radio station to the public. "It will have a more rhythmic feel. We did a little programming stunt, just to get people talking about the change," Levine said. Alex Shomar, a junior bioengineering student at Binghamton University, heard the song multiple times on the radio, then text-messaged Levine, whom he knew was working at the station. "I said, you know it's just playing 'Beat It' on repeat, you might want to get on that because something might be broken," Shomar said. Maureen Gallivan, a Spanish teacher at Corcoran High School in Syracuse, also heard the song on repeat and thought it was some sort of flashback day or fundraiser. "What I thought it might be originally is where maybe a DJ locks himself in the studio until he raises a certain amount of money," Gallivan said. "I knew there had to be some catch. I thought it was pretty cool." However, not everybody took the stunt lightly, as an unidentified listener ended up calling 911. "They thought someone had broken into the station, taken over the airways and was messing with us," said Levine. The emergency operator forwarded the call to the Department of Public Safety, which sent Officer Carol Lodman over to check on the situation around 1:45 p.m.
No report was filed, and Lodman was unavailable for comment. "I think this shows that radio is still really important, if we have this many people calling in," she said. A lawsuit brought against Michael Jackson by a 22-year-old man whose testimony was characterized as "the ravings of an unbalanced celebrity stalker" by the singer's lawyers, was dismissed Monday after the plaintiff failed to show up for the start of his trial. "I think the judge realized how crazy the lawsuit was," Jackson attorney Thomas C. Mundell told reporters outside the courtroom after Los Angeles Superior Court Judge Rold Treu granted his motion to toss the case. In his original lawsuit filed in January 2006 in Orange County, and then refiled in Los Angeles that March, Daniel Kapon accused Jackson of a litany of sins, including child molestation, assault, battery, false imprisonment, plagiarism and fraud. Kapon stated in his complaint that, starting in 1987, when he was 2, Jackson started molesting him and over the next 12 years subjected him to numerous charges. To add insult to injury, Jackson then stole song ideas from him between 1987 and 1997, Kapon claimed. Treu tossed out a handful of allegations in December 2006, including everything related to musical thievery, but let accusations of assault, battery, false imprisonment and a sexual battery cause of action stand. On Thursday, the judge granted a motion filed by Kapon's most recent attorney, Barry Fischer, to be relieved as counsel. Fischer said that he hadn't heard from Kapon since November and didn't know whether he is "ill, dead or simply refusing to respond." The lawyer filed a missing persons report with the L.A. Police Department on Jan. 3 and attached it to his request to step down. According to court documents filed Dec. 17 by Jackson's camp, Kapon killed what was left of his credibility when he was deposed last month. At the time, he testified that he fathered Jackson's two oldest children, Prince and Paris. "He was obsessed with geniuses and blood lines and he told me that he wanted to continue my blood line, which he believed to be related to the Rothschilds," Kapon said. Kapon's mother was in Jackson's "Thriller" video, the plaintiff stated, and the platinum-selling artist later fell "madly in love" with her. He continued to include that his mother swapped vows with the entertainer multiple times. Elizabeth Taylor, Celine Dion, Elton John, Paul McCartney, Beyoncé Knowles and Diana Ross were among the guests at their various weddings, Kapon said. Per Kapon's complaint, it was after Jackson fell for his mom that he molested Kapon on and off for 12 years, both at Jackson's Encino, California, home and at his famed Neverland Ranch. Also according to the Dec. 17 filing, at another point during the deposition, Kapon claimed to have seen Jackson dining with Cuban dictator Fidel Castro at a New York restaurant. "These are not good-faith deposition answers," Mundell wrote in his filing. "They are the ravings of an unbalanced celebrity stalker." Nothing has been confirmed, at this present time, regarding any tour dates. Happy New Year to you! Discussions are continuing but nothing has been finalized at this time. Michael wasn't on "Bet Honors"
"Michael Jackson was a scheduled guest, but he pulled out of the event. R&B star Ne-Yo wasn't feeling too bad about performing without his idol in the wings. "He has let me know a few times that he appreciates what it is that I do, and that's enough for me." Besides the event take place on January 12, but not as annoucmented michalejackson.com website about date February 12. Althogh website made correct this information in quick time. Date: 11.01.08 Michael Jackson will be honored at "THE BET HONORS"
THE BET HONORS celebrates black achievement in business, entertainment, social justice and philanthropy while providing the kind of award-winning, show-stopping musical performances that make BET specials deliver huge results. During Black History Month, BET will celebrate the achievement of black Americans by honoring the brightest, the most talented, the most ambitious, the most generous and the most crusading members of the African-American community. THE BET HONORS will celebrate the best in the black community with electrifying performances by the biggest names in music including John Legend, Stevie Wonder, Erykah Badu, Jill Scott and more. The 2008 BET Honors will be taped on January 12th at Washington, D.C.s Warner Theatre, featuring key guests of honor Alicia Keys,Tyra Banks, Janice Bryant Howroyd, Richard Parsons, Maxine Waters, and Cornel West. Michael Jackson is the latest recipient of a BET Honors special, which will air in February. It will feature a large segment on Thriller. John Legend, Stevie Wonder, Jill Scott, Erykah Badu, and Wyclef Jean will also appear. Hosted by Cedric The Entertainer, the program will air on BET on February 22nd. "The Wiz 30th Anniversary Edition" is being re-released on February 12 2008. The Wiz will be released worldwide in an ALL REGION format. Michael Jackson and his three children, Prince Michael I, Paris and Prince Michael II (aka Blanket), taking an after-hours tours of Madame Tussauds Las Vegas (Venetian) on Monday night. They showed up about 9:45 p.m. and made stops for photos in front of the wax icons, including Jackson's. He asked to see the newly arrived Evel Knievel figure, which was in the studio where repairs are made. Artists including Michael Jackson and Will Smith and distributors Sony BMG Music Entertainment and Universal Music Group have been sued for copyright infringement for the use of the song "Different Strokes". Syl Johnson(real name, Sylvester Thompson) of Cook County, Ill., and Sly-Zel Music Co. and Twilight Record Co. claim in a complaint filed Friday in federal court in Chicago that since 1991 the defendants were "substantially copying, publicly performing, making and distributing or authorizing the making and distributing" of records and sharing the proceeds from the use of the song. He alleges in the copyright infringement suit that Jackson's "Blood on the Dance Floor," Smith's "Who Stole the D.J.," and Tupac's "Peep Game" all borrowed from his 1967 hit "Different Strokes". The other defendants named in the complaint are the estate of Tupac Shakur, KRS One and Boogie Down Production (aka Lawrence Parker), Peedi Crakk & Young Chris, Mijac Music, EMI/Capitol Records, Zomba Enterprises, Amaru Entertainment and Universal Publishing. The plaintiffs asked the court to prohibit the performers and music companies from making or distributing records that may further infringe on the song's copyright, first issued in 1967. They also seek unspecified damages. Smith's rep tells TMZ they don't comment on pending litigation, while reps for Jackson, and Tupac's estate, didn't return messages seeking comment. Documents can be found here.